It is always believed that if a picture captured with an artistic mindset, it has the power of turning a mere piece of paper into something immensely valuable. With a completely artistic mindset the very talented photographer, Gaston Lacombe has captured Antarctica in a completely new light. The picturesque locations he has picked there, speaks a thousand words through his lenses. He is from Washington, D.C, but for portraying the untouched beauty of nature present in Antarctica, he spent 2 months there. He actually captured and presented us with the unknown side of Antarctica and named the series Penguins Capaes. 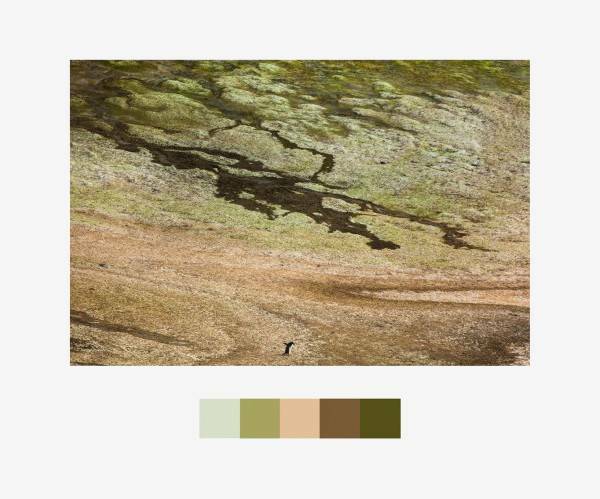 This picture captured shows different hues, from white to brown. The white represents ice but the brown hue formation happens because of the collection of thaw. 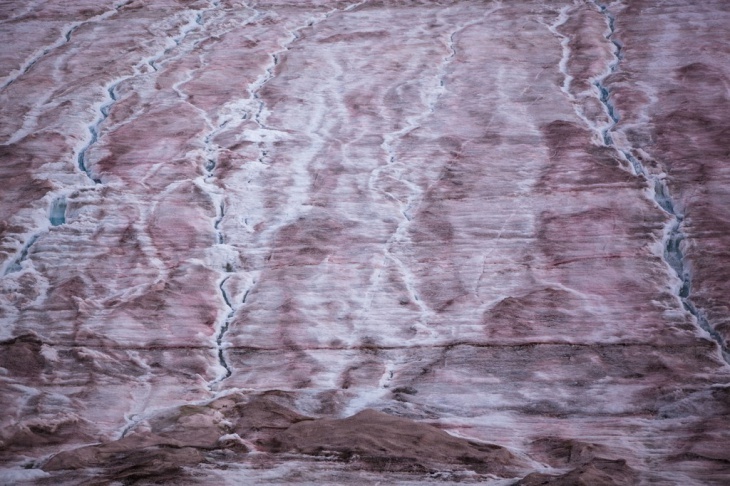 The dirt sediments on ice surface add uniqueness to it. 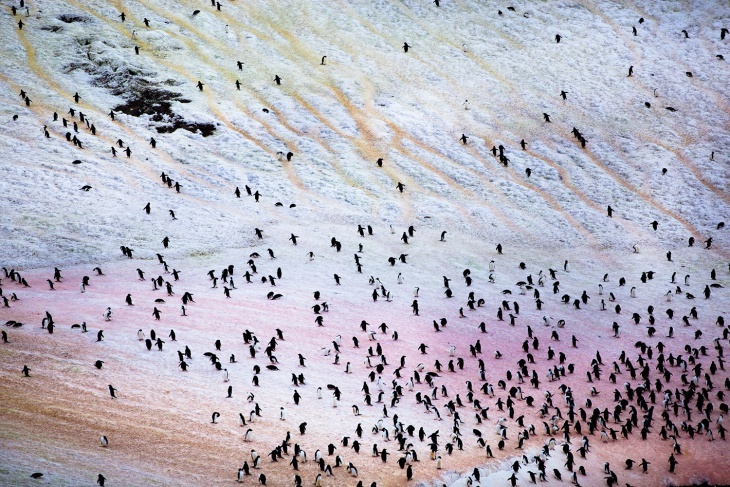 The photographer captures the penguin colonies where the hue of the land changes to pink. This happens due to the discharge from the penguins because of their diet of krill. 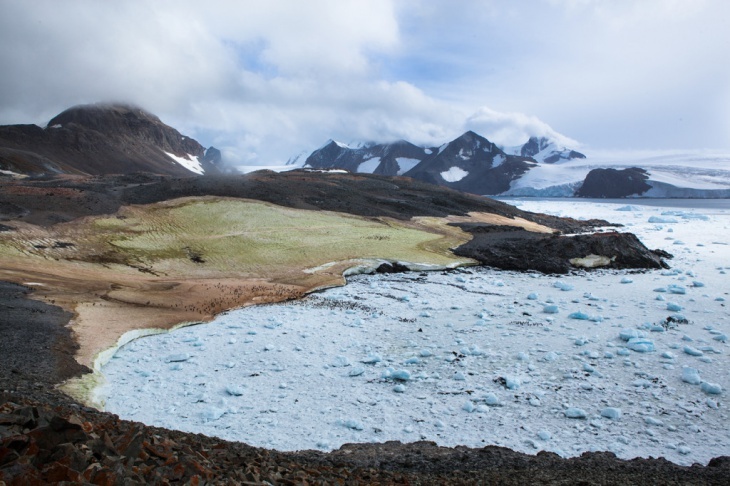 This photograph also shows the presence of both white and brown hues in the lands of Antarctica. 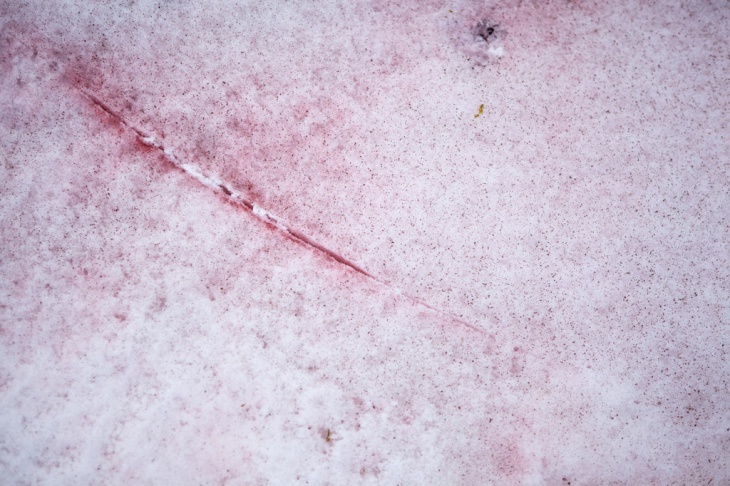 It zooms on the formation of cracks on the land surface for ice melting. 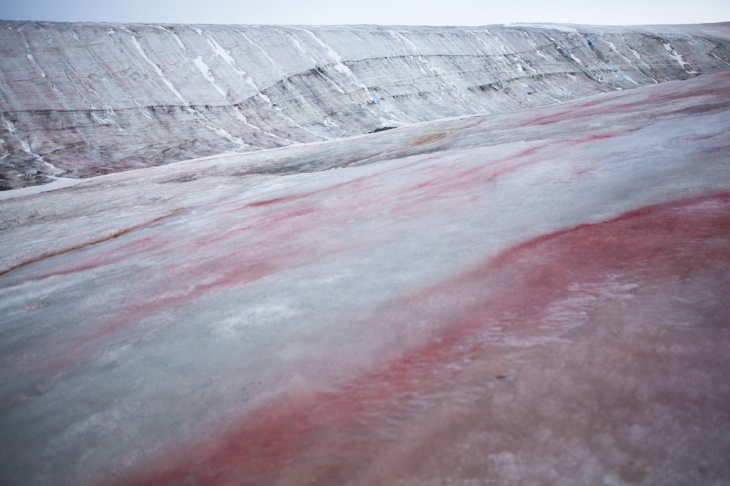 This photograph shows the presence of color red on the land surface which was surprising for the photographer too. 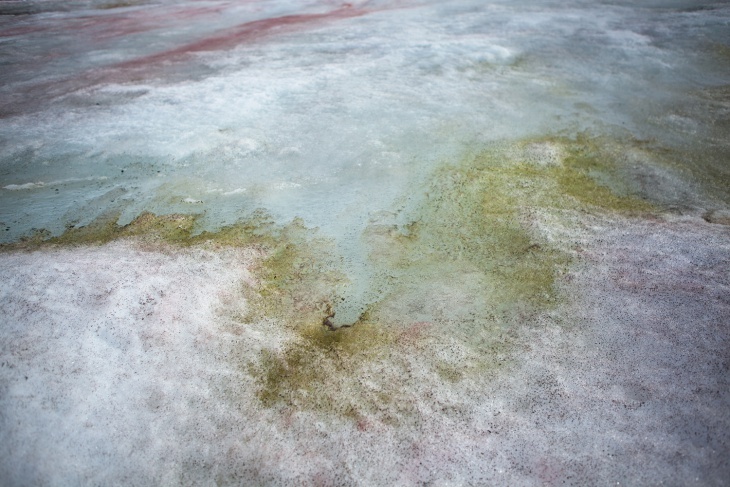 This happens due to the red algae present in the ice. This one is absolutely beautiful, as it captures everything in one frame. 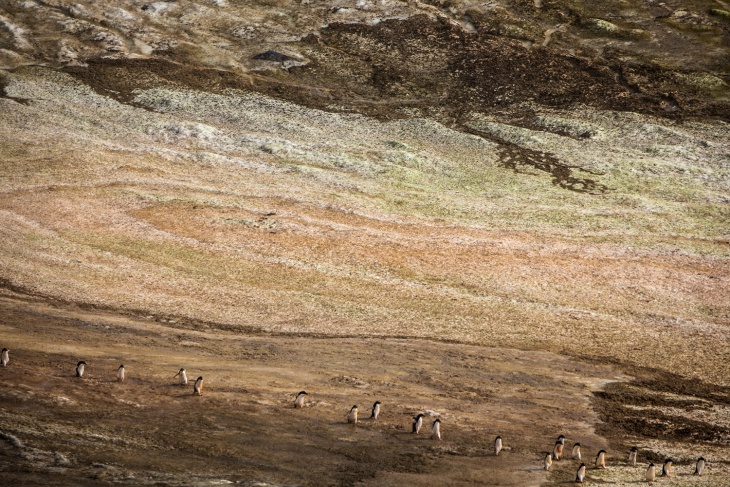 The water, the land texture, and color comprising of white, brown, pink and even red hues along with penguins. This one is another one from the Penguinscapes, he captured the beautiful land comprising of various shades of color. A single penguin standing amidst that beautiful barren land speaks a lot. This photo captures the true beauty of the land in the shade of red amidst the snow. A bird flying over the picturesque land has added to the beauty of the place. 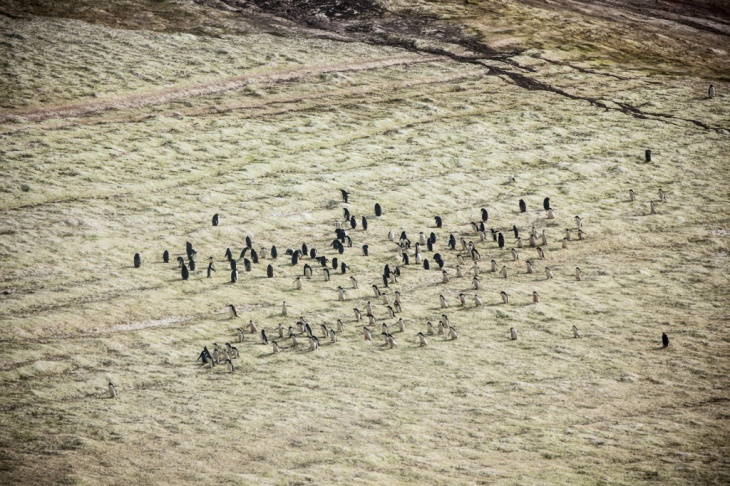 This photo from the series Penguinscapes, shows color green due to green algae, on the land surface. The picture looks dreamy and it even shows the water body in its beautiful shade. This photo captured portrays a very happy look comprising of the penguins. Numerous penguins are getting dipped in the sea and the rest are happily standing on the shore. 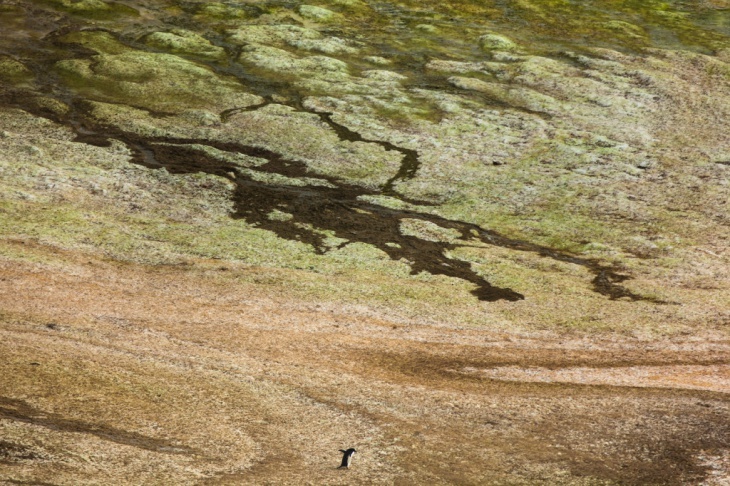 The powerful photo again showcases so many shades of colors, especially the green shade evident with the presence of green algae on the surface and a penguin standing amidst all that. This photo from Penguinscapes is mesmerizing. 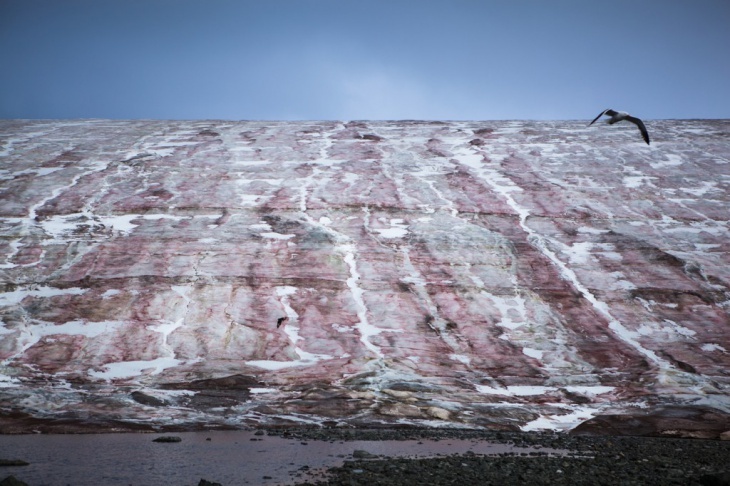 It captured the icy mountains and the lands with shades of red beautifully contrasting the total view because of the presence of red algae. 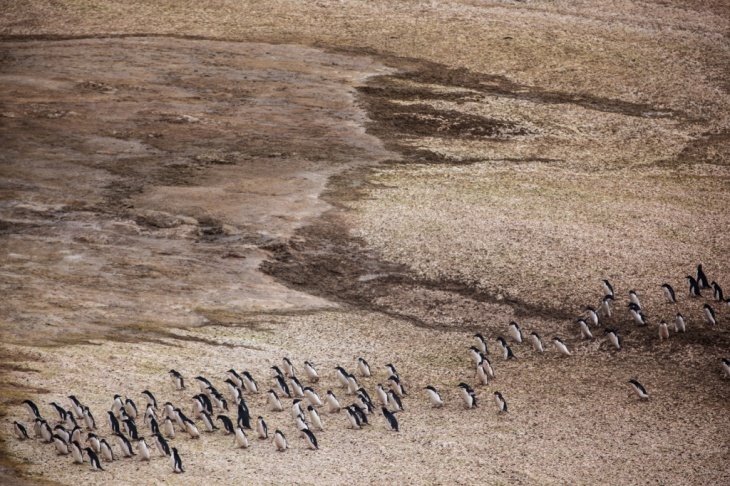 The photo from Penguinscapes, again focuses on a penguin colony, where all the penguins are happily enjoying amongst the beautiful barren lands spread all over, having brown and white hues. 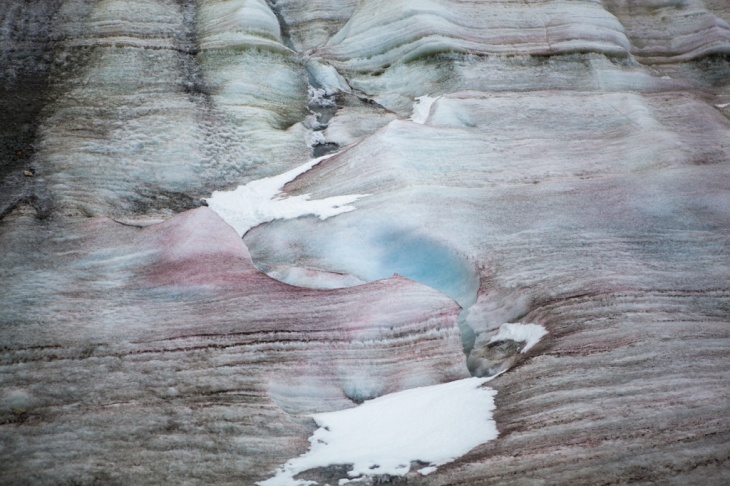 This photo captured shows the unevenness of the lands in Antarctica, which happened in the course of time with snowfall and ice formation, having many shades of color on its surface. The photo from Penguinscapes is simply beautiful. 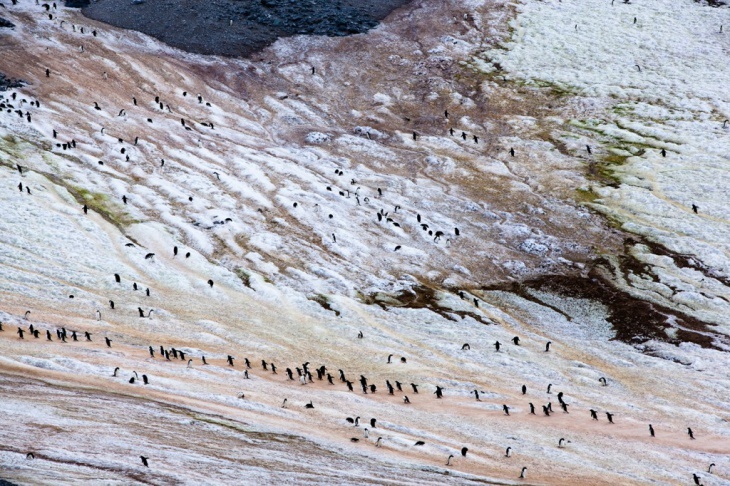 It shows a penguin colony crossing a part of the land where the color of land is more of brown than white due to thaw formation. This photo captured the land in almost dark brown hue. Brown dirt sediment on the surface of the land has created it and penguin colony moving to its destination unknown. 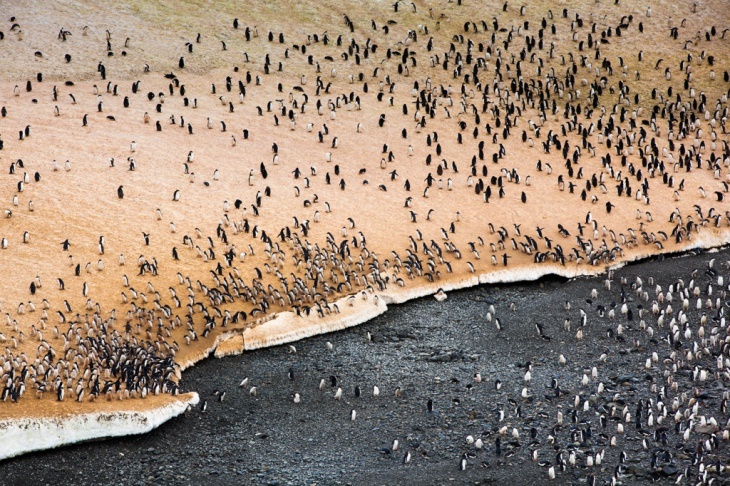 Gaston Lacombe braved every weather condition and presented us with a beautiful photograph series ‘Penguinscapes’. He captured Antarctica to help us learn the unseen beauty it possesses. He gave a message that nature should be preserved and global warming should be prevented in order to keep the beauty of Antarctica alive.